I think it’s time to talk genetically modified/engineered foods, also known as GMOs or genetically modified organisms. Pretty much, the stuff you’ve already been eating. The following is a documentary that covers one of the companies most notorious for the oversaturation of genetically modified foods in our lives, Monsanto. Lovingly known as frankenfoods or cloned food… GMOs are foods that have had their DNA altered in some form or fashion. The most common reason behind altering the DNA of a food item has to do with the ability to make the item resistant to the effects of pesticides, or to cause the item to grow twice as fast as normal. More recently Monsanto received a bad reputation for the promotion of growth hormones from GE organisms known as rBGH, which the company sells in the US under the brand name Posilac. 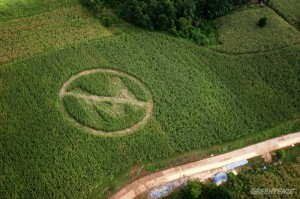 Monsanto claims that Posilac holds, “benefits to consumers”. The reality is that, rBGH growth hormones were banned in Europe and Canada after the authorities found out about the health risks resulting from drinking milk from cows treated with rBGH hormones. Monsanto’s way of “addressing” this problem was to sue the Oakhurst dairy company in the state of Maine (US) – attempting to force them, and other dairies, to stop labelling diary products “rBGH-free” and “rBST-free”. Patents on seeds give companies like Monsanto unprecedented power. Monsanto prohibits farmers saving patented GE seeds from one crop to replant the next season, an age-old practice. To ensure that farmers do not reuse seeds, Monsanto created its own ‘gene police’, and encourages farmers to turn in their neighbors. But Monsanto’s influence doesn’t stop at the US border. “The world according to Monsanto”, documents the devastating impact of Monsanto’s malpractices around the world. Among others, it includes the real-life stories of cotton farmers in India that ended up in hopeless debts after using Monsanto genetically engineered (so called Bt) cotton, and of a family in Paraguay, South America whose dreams have turned to nightmares after their farm became surrounded by fields planted with Monsanto’s GE soya. Monsanto wouldn’t address these issues on camera for Robin, instead referring to the “Monsanto Pledge” posted on their website ( which we debunk here). Thoughts? Questions? I’ll be spending the week writing about this, so… let’s hear ’em! I’m not necessarily bothered by the basic idea of genetic engineering. Crops and livestock of a couple hundred years ago were themselves the product of a primitive version of genetic engineering. When a farmer wanted bigger chickens, he’d breed a big rooster with a big hen. Even choosing to cultivate certain plants rather than others is a sort of genetic selection process. That being said, Monsanto’s approach is drastically overreaching and dangerously ignorant. It’s a fundamental fact of biology that a species can’t rely on a tiny gene pool without being in extreme danger of extinction from pests, disease, and so on; our species, by relying on that precarious food chain instead of encouraging robust biodiversity, is putting ourselves in danger. Unfortunately, Monsanto’s not the only one guilty of this. Most of the food produced these days are from a monoculture. I agree it’s a foolish practice, I guess it shows something about us that we turn to companies like Monsanto and their solutions rather than just diversify our crops or come up with real solutions. I saw Food Inc last night and was thoroughly digusted by these food corporations and the collusion between the FDA and the USDA with these monsters. It’s sickening that we the public don’t see what’s really going on. I do have an issue with corporations -namely Monsanto- stating that they own the patent to a seed. What this is saying is that a * for profit corporation* controls the food supply. That is staggering to me. I researched this after seeing Food Inc a while back. I feel for the farmers especially those who have been harassed, targeted, and sued. I can almost put money on the fact that most of produce from Monsanto are already in most grocery stores, especially in the hood. I wish GMO’s were banned here in the states, but maybe I’m overreaching(?) Great post! This company is sickening. I’ve been reading up on this & its shocking as to how they are able to get away with murder, in a sense. Why is the US the only ones to not ban this company? Their old employees now work for the usda, wtf! & now u have to be careful with some organic foods too….& to think a bill could potentially be passed to make growing your own food illegal. Its a greedy world that we live in today. This is unfortunately very old news. Since the middle of 00’s Monsanto have started to patent DNA structure and variations form our most common farm animals meaning that farmers now have to pay royalty to Monsanto if they find this particular DNA in one of their animals. Something that met extreme protest in Europe where we gone as far as to ban US meat and actually made it illegal to ad hormones or manipulate (GMO) No kattle are to be treated with anibiotics without proper labeling on the meat. This dosen’t work perfect in every case but the laws are there to protect the people and there are also in use, prosecuting producers every year. I resently moved to the US from Scandinavia and even thou I live in California where there acctually is possible to find decent food im still CHOCKED over the poor food choices, (even in a city as L.A) and peoples lack of basic knowledge in nutrition. When I called the producer of the organic ground beef sold at Whole foods she told me that every pack may contain beef from about 200 different cows form 3 DIFFERENT CONTINENTS (It says product of the USA on the label). Just reading the label of any ordinary food as beef, milk or bread freaks me out as GMO and added hormones are used in almost everything here. This has made me go from healt aware to extremly aware since coming here. I understand that farmfresh meat and diary isn’t available for everyone (It is indeed a question of money and accsess). But the only solution for change is for us as consumers to do our research, ask questions (actually use the phone numbers provided on the products to ask what “non vegitarian food” actually means. Since when does cows eat non vegetarian food? ) and skip cheap meat for the sake of our health. In the end we are the ones deciding what we spend our money on. We can talk about till we’re blue in the face (literally) but ultimately we have to research what we’re eating so we can make informed decisions. The government is about public money, not public health or safety. Sad but true. This is sickening. Now this company is trying to take away power from the farmers. All these farmers being harassed by this company. Next is that this company will come up with a pinneaple coconut fruit. Leave the food alone. What are the long term effects on the body from these genetically modified foods. I feel like there is a lot of Monsanto blame. FYI, Monsanto isn’t the biggest chemical company. They may have started genetic modification but companies like Bayer (yes, that Bayer) have taken the lead in the ag industry. Even farmers prefer Bayer over Monsanto. If you really want to “demonize” the food industry, don’t look at just one party. My main major concern with the GMO debate is the argument is being made by people who can afford to pay organic food prices. What about the people who make less than $15k per year? How will they be able to afford to buy fruits, veggies and meat (conventionally or organic) when GMO labeling takes affect and drive the costs up for everything? Has a provision been included to subsidize costs for below or slightly above the poverty line? This isn’t true, and I think we need to think about how supply and demand works. Demand increases, supply increases, price comes down. Not only that, but seeing as how our government threw its financial support behind growing certain commodity crops, there shouldn’t be much reason why they government couldn’t throw its weight behind bringing down the cost of non-GMO products. Enough citizens need to speak up and speak out. Furthermore, people tend to ignore one of the most obvious ways to avoid GMOs, and that’s buying fresh produce that ISN’T GMO and avoiding processed foods entirely. It’s absolutely plausible – I’ve done it before for a campaign I worked on with Anytime Fitness, and I shared all of my details on how to do it. Is there a learning curve involved? Yes, and that’s the hardest part. But it’s necessary.